The bonus pack dice are on top and the dice from The Cards Of Cthulhu are on the bottom. The bonus dice have the design stamped on rather than engraved, but this does allow for brighter colors. The coin bonus pack includes ten regular experience tokens and five higher value experience tokens! Unlike the dice, the bonus pack tokens are exactly the same as their counterparts from the boxed board games, right down to the metallic “clank” they make when you plunk them down. 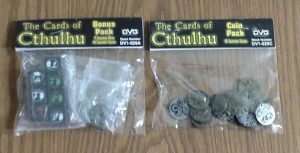 But you aren’t limited to use of these goodies with The Cards Of Cthulhu or its expansion. Why not substitute these dice for the dice included with Cthulhu Yahtzee and Cthulhu Monopoly to make things creepier? Yes, those games actually exist. But You don’t have to buy a game to use them with! There are numerous versions of the rules for the dice game Farkle online which can be used to play a Cthulhu version of the game. Also, the free printable board game Phantom’s Vortex has Lovecraftian elements so using these dice can add to the overall effect. You can even use the experience tokens as substitute pawns for whatever two player board games you end up using these dice with. Speaking of dice, let’s talk about tabletop role-playing games. You could mix them in with your dice, but only having a single Cthulhu die among your regular polyhedral dice might seem a bit off (especially depending on the game’s fictional setting). They are a better fit for horror RPGs but using dice with Cthulhu on them does lead players to expect Mythos-related situations. Thankfully, there are plenty of tabletop Cthulhu RPGs with free rules which only require six-sided dice (aka d6) to play. Several of them already have free adventures to download as well! R. Talsorian Games’ Fuzion system is used to play the homebrew Lovecraft RPG Tekeli-Li! Pelegrine Press’ GUMSHOE and GUMSHOE One-2-One can be used to play Trail of Cthulhu and Cthulhu Confidential. The rhyme can be adjust to fit the other conversion suggestions if need be. Since Fudge was used to create Fate (which also uses those funny dice), you can potentially create a conversion for that system as well! If you go that route, you might want to check out the “Fate Accelerated” tab on the Fate System Reference Document in order to see the quickest and easiest version of the game you can play. 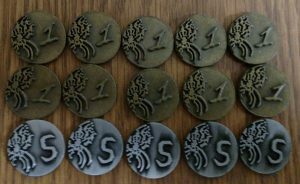 As an added bonus, you can use the experience tokens to help with the “Sanity Loss” rules utilized by most Cthulhu role-playing games! Both the dice and tokens have potential in home haunting as well! The tokens could be mixed in with the treasure in a pirate or wizard’s room as a nice injoke. 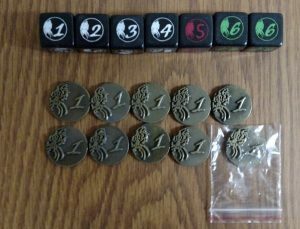 Why not set up a spooky board game in your next haunted playroom and use the appropriate number Cthulhu dice? Lighting the room with a black light should give the designs a wonderfully creepy glow (especially the bonus pack versions). Just make sure the game are isn’t accessible or has a hidden assistant nearby in order to keep visitors from taking the dice. You know they’ll want to after taking one look at them. 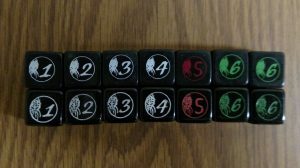 Let’s revive this old idea about using RPG dice in a haunt and put a Mythos spin on it. Visitors enter a darkened room decorated to look like the sanctum of a Cthulhu cultist. A crude altar is surrounded by artificial candles and one or more idols. These idols can be sculpted from clay or purchased, it’s up to you. It’s also up to you if the altar will be on a simple wooden table or a faux stone one made from shaped and painted styrofoam. Be sure to do it outdoors or in a well-ventilated area if you go the styrofoam route. Experience tokens can be piled somewhere if desired. One or more forbidden tomes are a must. You can even include a bottomless pit if you want to get really elaborate. A few blood stains should imply its use to your guests. A robed cultist can either be sitting in the room or can wait in a hidden spot to surprise guests. The dice can either be kept out in the open (and lit with a black light if possible) or kept in a dice bag held by the cultist. Upon confronting the guests, the cultist will announce they will determine their fate and roll the dice in a special dice tray. Use a dice tray you have either made or purchased, but make sure it references Cthulhu or some other element of the Mythos in some way. No matter what is rolled, have the cultist warn the players of their doom and quickly usher them out of the room. Those concerned about the paint eventually coming off from heavy use will either want to stock up on bonus dice packs, opt for the engraved dice from the original game or try some of the dice-saving tips I came up with in my review of said game. Considering all of the uses these bonus packs have, it would be foolish not to pick up some! Special thanks to Dan Verssen Games for the review copies!